German business and consumer confidence fell more than economists forecast in August, raising the likelihood that Europe's largest economy may now be steadily slipping into a recession. 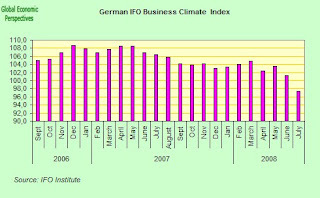 The Munich-based Ifo institute's business climate index, based on a survey of 7,000 executives, dropped to a three-year low of 94.8 from 97.5 in July. Ifo's gauge of business expectations dropped to 87, the lowest since February 1993, when Germany was experiencing the worst recession of the past two decades. 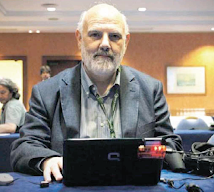 A measure of current conditions eased to 103.2 from 105.7. 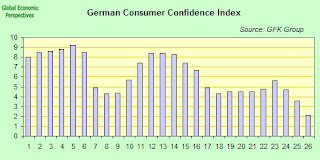 "The German economy is encountering an increasingly more difficult situation,"
At the same time GfK AG's consumer sentiment reading slumped to its lowest level in five years. GfK AG's index for September, based on a survey of about 2,000 people, fell to 1.5, the lowest since June 2003, from a revised 1.9 in August, the Nuremberg-based market-research company said in a statement today. GfK's sub-index measuring economic expectations plunged to minus 21.8 from minus 8. A measure of consumers' propensity to spend fell to minus 27.9 from minus 26.2 while a gauge of income expectations improved to minus 16.8 from minus 20. 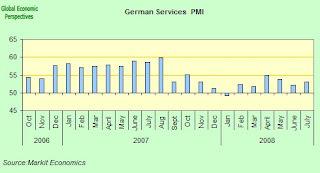 Further detailed data released today by the Federal Statistics Office confirmed that the German economy contracted in the second quarter, while most of the short term indicators we are now receiving seem to suggest that it may fail to grow in the third quarter as well. While oil prices have receded from a record $147.27 a barrel, they're still up 60 percent over the past year, putting pressure on consumer spending power and just as the slowdown in Southern European economies like Spain and Italy start to weigh heavily on German exports. The economy contracted 0.5 percent in the three months through June as construction dropped back sharply and companies and households reduced spending, according to the detailed data from the Federal Statistics Office. Building investment was down 3.5 percent in Q2 from the previous quarter, investment in plant and machinery fell 0.5 percent and consumer spending decreased 0.7 percent. Gross domestic product fell a seasonally adjusted 0.5 percent from the first quarter, when it rose a revised 1.3 percent. The Q2 contraction is the biggest drop since the second quarter of 1998. Ironically, the headline GDP number was helped by a sharp drop in imports. This drop in imports was the direct result of a weakening in domestic demand (down 0.3% on the quarter), and thus GDP growth was improved by people actually getting worse off. "However, growth was supported by foreign trade. Compared with the first quarter of 2008, downward trends were recorded for both exports and imports. As, however, imports decreased much more strongly (–1.3%) than exports (–0.2%), the resulting export surplus (net exports) contributed 0.4 percentage points to economic growth." while services fared a little better, coming in at 53.1, which was slightly up from July's 52.1. 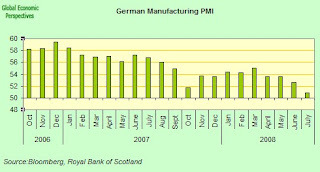 All in all the outlook which seem to hinge on what happens to German imports and exports in August and September. Looking at what just happened in Georgia, and given the dependence of Germany on exports to Russia and the CEE, it is hard to be optimistic at this point about German export growth.